Timezone is the leading fun family interactive entertainment center that offers state-of-the-art attractive and popular simulation games in a safe, friendly, brightly lit and happy environment. 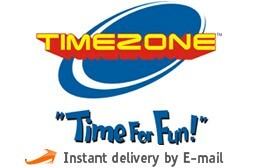 Timezone has literally redefined the meaning of fun and is a great place for the young and the ‘young at heart’ to hang out. 1. E- Gift card holds no value until activated. 2. E-Gift card is valid for a period of 180 days from the date of issue. 3. E-Gift card is redeemable only in Timezone Outlets across India, for playing games and the full value of the gift card would be loaded on a Timezone power card. 4. If the e-gift card is lost or stolen, neither will a new e-gift card be issued nor will the money be reimbursed in any manner. 5. E-Gift card is not redeemable for cash nor be exchanged for a gift voucher nor a credit note be issued. 6. The e-gift card has security features and the e-gift card once redeemed cannot be reused. 7. Timezone reserves the right at any time without prior notice to add, alter, modify, all or any of these terms and conditions. The decision of Timezone is final and binding.